The motorway slip road provides you with the space to gain some speed and match the acceleration of cars already on the road. This will make it easier for you to indicate and pull on. Make sure you use this space to get up to 60-70mph as soon as you can. Then, check your mirrors and make sure there is space to pull in. 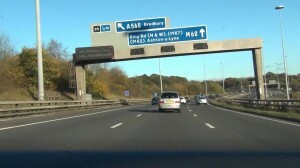 Drivers will usually make some room for you if you indicate and show you're going to join the motorway. Once you know it's safe, you are good to go. Motorway driving can be hazardous. If someone a few cars ahead comes to a sudden halt, for instance, you may be expected to come to a fairly abrupt stop from speeds as high as 70mph. The best way to keep yourself and other road users safe on a motorway is to leave as much space between you and the car in front as you can. The two second rule is usually a good one to go by. Find a point ahead of you (a sign, a bridge, etc.) and see how long it takes between the driver in front and you to reach it. Ideally, there should be a two second gap. This is one of those unwritten rules we talked about earlier. It's not illegal in any sense, being in the wrong motorway lane can be a real nuisance to drivers behind you and cause unnecessary traffic delays. If you are going slower (or at the same speed) as the cars on the left lane, stay there. You only need to move over to the middle lane if you are overtaking a car that's going slower than you on the left lane. The right lane, meanwhile, is reserved for the fastest drivers.